The first step in the successful control of a fly problem is inspecting your property to determine where the flies are living and breeding, and how the flies are getting into the house. Once this is known, sanitation, exclusion, and mechanical or chemical controls will help to keep them out. Watch the flies. See where they are landing or resting; find out what is attracting them. Identify the flies. 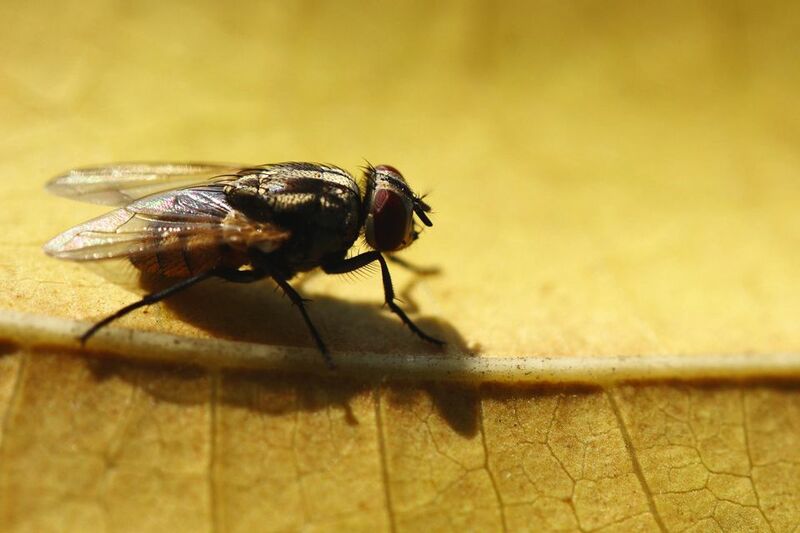 Understanding whether you are dealing with house flies, blow flies, cluster flies, or other large flies will determine the type of management needed. If there are a lot of flies, there is probably a breeding site either on your property or a neighboring one. Look for these areas as well. If the source is not on your property try to locate it and have the responsible persons help solve the problem. If cooperation cannot be obtained from the neighboring person or business, you can contact your municipal or state health department to seek assistance. Although you can temporarily reduce populations by killing the adult flies, you can't gain full control until you find and eliminate the source. Once you have inspected and know where the flies are and why they are attracted to that site, you can begin the fly control process. Clean up or otherwise alter any sites where the flies are seen to be living and breeding, and any that are attracting them to feed. The house fly can complete its life cycle in as little as a week, so any wet organic materials and manure need to be removed, and garbage picked up at least twice a week to break the breeding cycle. Keep dumpster areas as clean and as far from the home as possible. Use tight-fitting lids, and clean trash bins regularly. If plastic bags are used, ensure they are well sealed. Pick up pet feces regularly, and remove any dead or decaying plants. Keep dog kennels clean, pick up food after the dog's feeding time as much as possible, can clean up any spilled food or water. Eliminate areas of pooling, stagnate water, and other excessive moisture around the yard. Keep compost piles far from the home and properly managed to keep flies to a minimum. Seal cracks around windows and doors where flies may enter. Use well-fitted, small-mesh, well-maintained screens on all doors and windows. Follow indoor fly exclusion techniques. Inverted cone traps containing fly food attractants. These are widely available and can be effective if sanitation is maintained in the area. The fly food attractants can be very foul smelling, so the traps should be placed away from occupied structures. Insecticide-impregnated resin strips, or "fly paper," can be placed on the inside of garbage can lids to attract and eliminate flies that get into the trash. If dumpsters seal tightly, they can be used there as well. Although they may have little effect in outdoor areas, ultraviolet light traps can be placed in alleyways, beneath trees, and around animal sleeping areas and manure piles to attract and kill flies. Though aerosol fly sprays will have little to no lasting effect outdoors, they can provide quick knockdown and kill flies on contact, so can be used just prior to picnics and outings – being sure that no insecticide contacts food or areas that food may contact. Insecticide fly baits can be put out in small bait stations to attract and kill flies. This can be particularly effective in dumpster areas if proper sanitation is followed. Always keep baits, and other pesticides, away from possible contact with children, pets, and non-target wildlife. Properly labeled residual pesticides can be used in areas where flies are seen to rest, such as the outside surfaces of homes and overhangs. A pest management professional can be hired to apply residual insecticides that are restricted use, or otherwise unavailable to homeowners. If insecticides are used, they may have to be reapplied every two to four weeks during warm weather. When using any pesticide, be sure to read the product label and follow all directions.